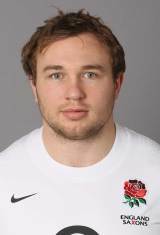 With one England cap to his name, Matt Mullan is yet to fully make his mark on the international scene but has shone for the Worcester Warriors at club level for a number of seasons. A product of the Warriors Academy, Mullan first came to prominence in the 2007/08 season with 25 appearances for Worcester in all competitions, followed by 24 matches in 2008/09. His senior debut had previously come in December 2005 against Newport Gwent Dragons in the Powergen Cup. Mullan's league debut arrived against London Irish in December 2007 and his two tries in top-flight competition were against London Wasps in April 2008 and Leicester Tigers the following September. Mullan was rewarded with a second call to the England Saxons' squad in July 2009. He had been called-up for training in January, but missed the match against Portugal through a rearranged league game, and was later denied a debut against Ireland A at Donnybrook when the match was cancelled because of frost. Mullan earned impressive reviews and replaced the injured Andrew Sheridan in the Senior squad for the 2010 Six Nations Championship. He made his senior international debut as a replacement for Tim Payne against Italy in Rome on 14 February 2010. A shoulder injury ruled Mullan out of the start of the 2010-11 season, however he returned to full fitness to play his part as top-flight status was secured. Mullan was rewarded for his comeback in the summer of 2011 when he was named in the England Saxons squad for the Churchill Cup taking place on home soil. Mullan penned a new deal during the 2011-12 season to remain at the Warriors and was one of the 42-players to get the nod for England's tour to South Africa.